Praying Mantids Take to the Road. Are They Suicidal or Giddy from Romance? 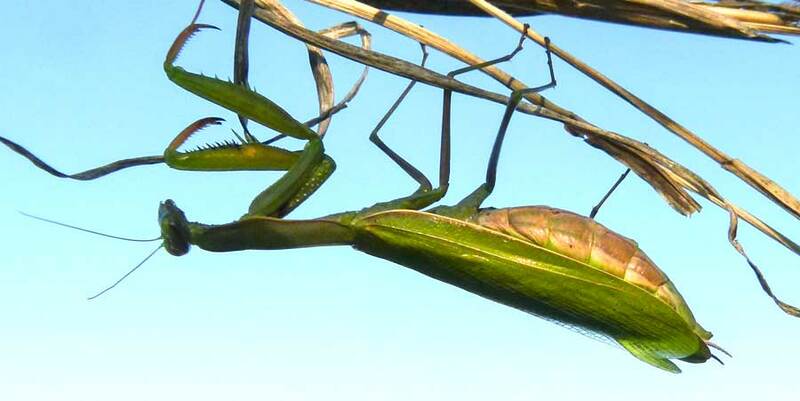 Usually, it’s very hard to find a praying mantis. These majestic insect predators camouflage themselves so skillfully you can stare and stare and never notice them. You’d swear they were just twigs until one condescends to move. To come upon one once or twice a summer is a true privilege. Um, which way to the off ramp? Now, on my autumn bike ride, I find them standing in the road. Last ride, I counted six. Four, of course, were flattened. The other two seemed casually waiting around for the speeding tires to take them out. So would could lure them from the safety of bushes out onto the suicide strip? Perhaps a real suicide wish, instant death on the pavement rather than a slow freeze in the coming cold. They look to me more like large females slowed by abdomens swollen with eggs waiting to be laid. They’re probably judgement impaired by the giddy euphoria of just biting off the head of their mate. Apparently, losing his head makes the male mate more wildly when the impediment of a brain is efficiently removed. Big mamma (I think) back in the long grass where she belongs. It’s the eggs that survive the winter in a sturdy egg case, not the mantids (plural of mantis for you spelling spotters). 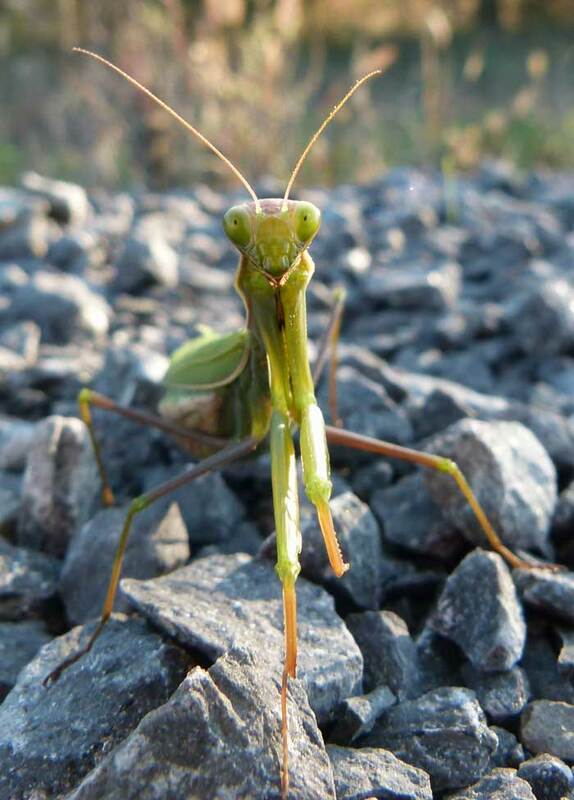 Of course you can keep a praying mantis indoors as a pet if you are willing to mist it daily for moisture and keep up the live cricket supply so it can hunt and dine gruesomely before your eyes. I bike around the dead ones, help the live ones across and hope I’m doing my bit to increase the hordes of new mantids hatching in the spring. How else do I get to stare and stare and pat myself on the back when I manage to spot one out in the greenery munching down a grasshopper and dreaming of headless romance. Previous Previous post: Dead Frog Alley: Biking the Splatter Road. Next Next post: First Snow of Winter. Always a Thump on the Side of the Head.